Arts Minister Lauren Moss (pictured) will not disclose the public vote count Anzac vs Desert Park; there seems to be no feasibility report but the gallery is an election promise. “We can now begin formal negotiations” but “the time for talk is over”. 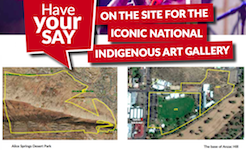 All we’ve got is $50m but the government “will now seek funding from the Federal Government and private sector to create an incredible new cultural asset and something all Australians are proud of.” ERWIN CHLANDA reports.